This post is dedicated to the winner of the Reader Survey 2010 Wine to Watch. Read about the Reader Survey 2009 Wine of the Year here. The 2010 Wine to Watch is for a wine you tasted that will be released next year that you believe will be exceptional. Again, thanks to readers who sent in nominations and who voted in the preliminary and final rounds. We’ll do it all again next year. 665 people cast their votes in the final round for the 2010 Wine to Watch (see the complete list of final voting below). Of the five finalists – all of which are wines to seek out in the coming year - voting between two wines went down to the final hour. Both of these wines are recognized here. William Church was established in 2005 by Rod and Leslie Balsley. The winery, located in Woodinville, is named after the Balsley’s fathers - William Edgar Balsley and John Church Lind. William Church makes a variety of red wines in addition to this Malbec, including a Syrah, Cabernet, and two proprietary blends – Two Spires and Bishop’s Blend. The winery also makes a Viognier, consistently one of the most enjoyable in the state. Malbec is an unsung hero in Washington. While Riesling is the most produced grape, Merlot was Washington’s ‘signature grape’ (before Sideways), Cabernet has thrived, and Syrah is waiting in the wings (or perhaps even has entered onto the main stage), Malbec is a grape many producers are quietly making and are bullish about. The list of Malbec producers is large and growing and includes Alexandria Nicole, àMaurice, Arbor Crest, Barnard Griffin, Dusted Valley, Eleven Winery, Elsom, Fidelitas, Five Star, Gamache, Gilbert Cellars, Goose Ridge, Hogue, Kennedy Shah, Kestrel, Lopez Island Vineyards, Maryhill, Michael Florentino, Mount Baker, Napeequa Vintners, Pleasant Hill, Portteus, Reininger, Sagelands, Saviah Cellars, Seven Hills, Terra Blanca, Three Rivers, Tildio, Townshend, Upland Estates, Vin du Lac, Wapato Point, and Willis Hall. Many of these wines are small production and don't make it out of the tasting room. This is another reason to travel Washington wine country and scour the shelves at your local wine store as Malbec shows a lot of promise in the state. William Church started making Malbec in 2006. The 2006 vintage received a 90 point rating from Wine Enthusiast and the 2007 vintage received a 'Double Gold' at the Seattle Wine Awards and a 'Platinum' from Wine Press Northwest. 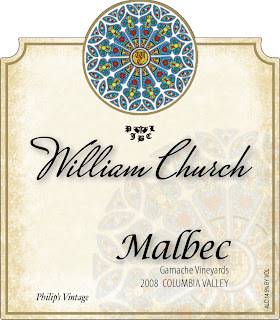 The 2008 William Church Malbec is 100% Malbec from Gamache Vineyard. I tasted this wine earlier this year, and it does not disappoint (look for tasting notes in a Woodinville report in the coming weeks). Regarding the upcoming 2008 vintage, the winery says this wine is "deep magenta in color with inviting aromas of black pepper and blackberry with violet notes. Dense layers of black fruit, blueberry and spice and a rich mouthfeel." 173 cases were produced. The 2008 William Church Malbec is expected to be released in June 2010 and to cost $30. Keep an eye on William Church at www.williamchurchwinery.com, www.facebook.com/williamchurchwinery, and Twitter WmChurchwinery. Betz Family Winery was founded by Bob and Cathy Betz in 1997. Since that time the winery has become one of the premier wineries in Washington. Betz produces two Bordeaux-style blends each year – the Pere de Famille, which is Cabernet based, and the Clos de Betz, which is Merlot based. The winery also produces three Syrahs and a Grenache-based blend. The 2007 Syrah and Grenache releases from Betz, which were released this Fall, were among the best the winery has produced. With 2007 the best vintage from Washington this decade, expectations for the Pere de Famille are appropriately high. This wine will be released in April 2010 and is expected to cost $55. Keep at eye on Betz at betzfamilywinery.com.